Chris Eubank’s opponent’s manager absolutely imploded today at a press conference in Germany with a bizarre tirade. 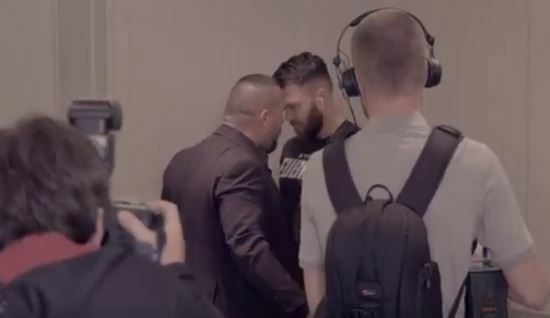 A boxing manager isn’t usually part of the story line of a professional boxing match – but Chris Eubank Jr’s opponent’s manager made himself one ahead of this weekend’s IBO super-middleweight title fight in Germany. He descended into a fit of rage after a member of Eubank Jr’s team got on his nerves by looking and apparently laughing at him. It was unclear as to who this was or what exactly he did, but this didn’t stop one of the most unusual tirades in boxing kicking off earlier today. It was almost reminiscent of a Mike Tyson press conference back in the day. Untapped, raw and unchecked – with a limited number of security present. What he said was very strong,. So, warning about the extreme language used in advance. One would imagine that this will help the event get a few more eyeballs this weekend but were the above remarks about another man’s wife really necessary? Boxing press conferences have to be up there with some of the nuttiest in all of pro sports, surely.